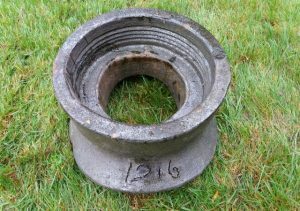 Found on the site of an old shale oil works, Broxburn, West Lothian. 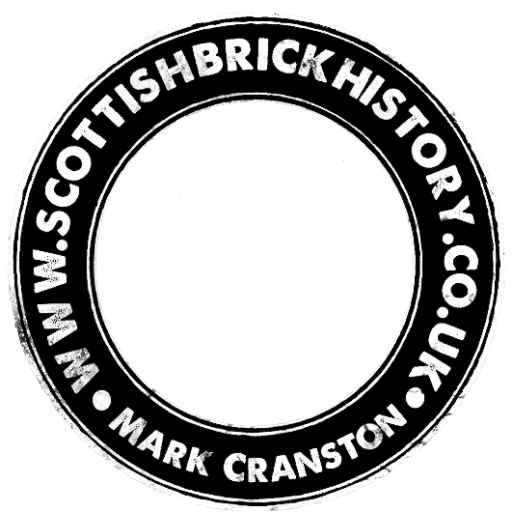 Heathfield Fireclay Works, Garnkirk. . . . .
Found at the Heathfield Fireclay Works. Although not marked as such there is little doubt this is a product of the Heathfield Fireclay Work. 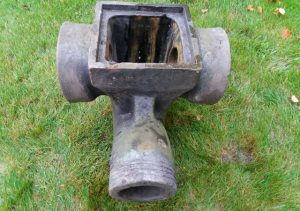 Left and top female ends – 10″ diam. Right male end – 7″ diam. Overall height – 19″ Overall length – 29″ . Found at the Heathfield Fireclay Works. 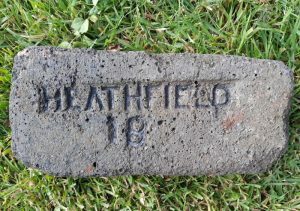 Although not marked as such there is little doubt this is a product of the Heathfield Fireclay Works. Top female end- 10″ diam. Bottom saddle – 11″ x 13″ . . .
Found at the Heathfield Fireclay Works. 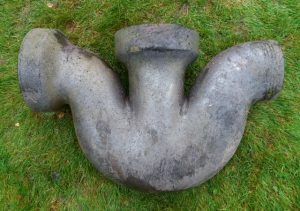 Although not marked as such there is little doubt this is a product of the Heathfield Fireclay Works. Top female end 8 1/2″ diam. 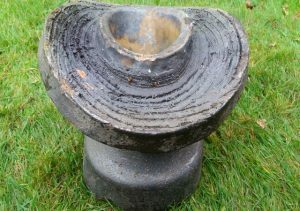 Bottom saddle 12″ x 6″ . . . .
Found at the Heathfield Fireclay Works. 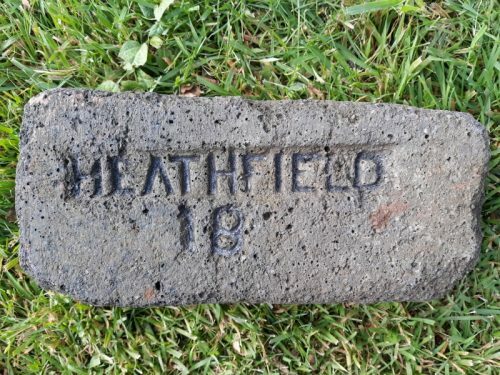 Although not marked as such there is little doubt this is a product of the Heathfield Fireclay Works. Overall length – 26″ Top circular inspection inlet – 15″ diam. Left male end – 7 1/2″ diam. 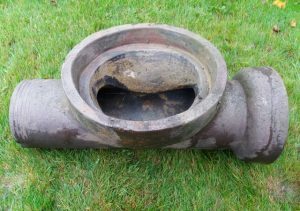 Right female end – 10″ diam. .
Found at the Heathfield Fireclay Works. 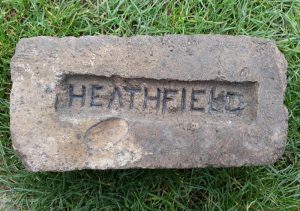 Although not marked as such there is little doubt this is a product of the Heathfield Fireclay Works. Top square – 9 1/2″ x 9 1/2″ Left and right female ends – 8″ diam. Front male end – 5 1/2″ diam. 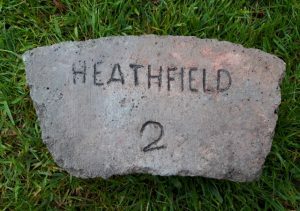 Height – 14″ . .
Found at the Heathfield Fireclay Works. 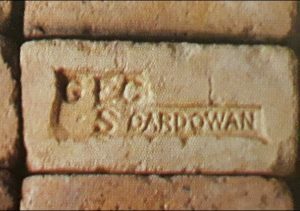 Unfortunately this brick is incomplete but there is no doubt as to the original brickmark. 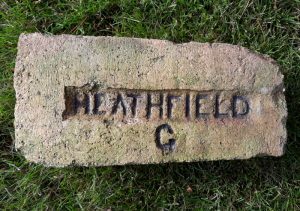 Heathfield Fireclay Works, Garnkirk. . . .